(From Tamron lens literature) Tamron's AF 19-35mm F/3.5-4.5 is a new affordable super wide-angle zoom ideal for travel, landscape, group portrait, adventure photography and more. Offering an authentic super wide-angle range with an angle of view of 97-63 degrees and a close M.O.D. of 19.68 inches, this 19-35mm provides dramatic and fun image making. The lens is easy to carry anywhere as it weighs just 10.5 ounces and is only 2.66 inches long. It also features a fixed front element group and filter mount, facilitating the use of polarizing filters. I use ist for 35mm and digital (Pentax k-x,k200). you must stop down this lens to f8-11, you'll discover it's highly performed sharpness. I use it between 400 and 800 ISO. After sharpening and interpolating big posters are possible. very content with it, because nearly no distorsion. The question for a lens like this is, what does it need to do well, or have, in order for it to be a good lens? Could you be happy with the images it gives you? Only one way to find out, isn't there. And at that price how can you turn it down? I think the big question is whether to get this for $100+ or the 17-35 for $200+ or your "factory" wide-angles for 3x as much or more. The rest is academic. It's wide, features will be relatively small, distortion high if the lens is not held level & square to target. Will the resulting blur and CA be acceptable to you? Only one way to find out. I can say one thing...this makes a *great* walking-around lens, if you're talking about walking around shooting landscapes with an SLR-sized camera and it *really* shines indoors and in confined spaces. I bought it thinking that it would be nice to try but now I'm worried that I would rarely want to take it off, unless the distortion just proves to be too much since it is so critical to shoot this lens square on the subject. It's the flip side of a 28-300. I almost wish that I had bought the 17-35, this is great, but that is supposedly a better piece of glass, this one is a bit dark & slow even wide-open, 17-35 is a better zoom range, it's only 3/4" longer, the same diameter & takes the same 77mm filter. Of course the 17-35 is twice as much for a lens that you may find yourself yanking off fairly often but if this makes sense then in the long run the 17-35 would probably make more sense (along with a DSLR with LiveView & a flip & twist LCD). It's a tough call. But the 19-35 is the right price to try and see if you really want to use this focal-length range and/or swap lenses in the first place, then upgrade to the 17-35 later. For value, this is the best deal on the market next to the Canon 50 f1.8 II for full frame. I bought this lens for a pack-trip into the Canadian rockies years ago due to it's weight and focal length, used on film and a 10D. Very pleased with the results - one photo taken just won a 2nd place in a pro judged photo contest - color landscape. 1. Flare: Will show red/magenta flare spots but handles veiling flair well - use the hood and your hat to shield the front element. Better than Canon 28-105mm f3.5-4.5 II. 2. Sharpness - good above f6.3, usable above f5.6 but corners start to soften. 3. Distortion: at 19/20mm is noticable in the corners but not really bad - keeping your camera level and square to the subject is more important. 4. Corner darkening/vignetting: Noticeable on full frame below f5.6, not a problem on APS sensors. 5. Construction: Better than kit lenses and Canon/Nikon low end. Typical Tamron high quality plastic, metal mount, I've had mine four years with no problems. 6. Bokeh/OOF: Haven't noticed any issues but mostly use this for landscapes. 7. Extras: Hood, lens cap, and six year warranty are unbeatable: Canon should be ashamed at what they offer (or don't offer) with their lenses: Consider that 4 cheap plastic lens hoods from Canon buys this lens. 8. Focus speed is good in good light, max aperture of f3.5 - 4.5 helps with viewfinder brightness and focus accuracy compared to typical f4.5-5.6 kit lenses. 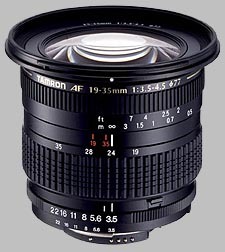 Recommendation: If you only shot APS sensors, the Nikon 18-55mm or Canon 18-55 IS kit lenses MAYBE a better deal - MAYBE. If you still shoot full frame - film or digital - nothing touches this lens for value. This, with a 50mm f1.8 standard lens make a very versatile lightweight travel/packing kit. Highly recommended as a budget option for full frame (film especially). Different manufacters make this lens, like tokina, vivitar, cosina and tamron. It seems a design by Cosina. Autofocus speed is ok. I guess most people will use it for scenery, so high speed focussing is not an issue then. Overall it isn't the sharpest lens around. Don't expect it to render fine detail with the highest percision. What it can do is taking nice shots with good color and contrast in an easy and light package. Best settings are from f5.6 to f/11. Image quality improves when using the zoom. When using strong USM you get the most detail out of it.